It has been only a few months since SNK-Playmore released the Art of Fighting Anthology and now another fighting franchise has arrived on the PS2. Despite the somewhat complex title, Fatal Fury Battle Archives Volume 1 provides gamers with the first four Fatal Fury games all on one disc. The FF series manages to hold up fairly well by today's gaming standards largely because it borrowed elements from another well-known fighting game franchise. Despite its lack of originality, there is still fun to extract from this compilation. 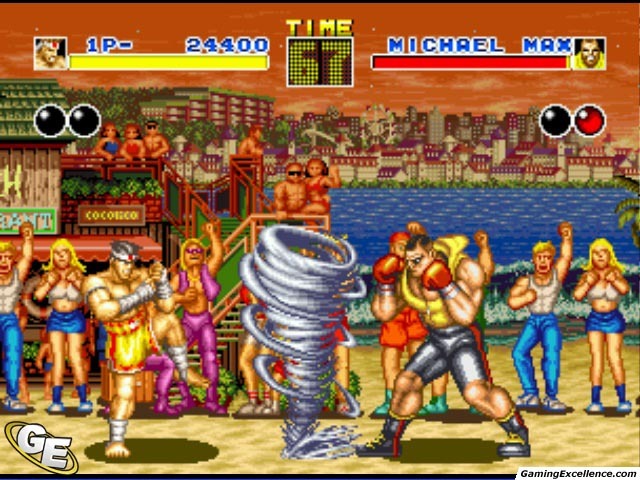 Fatal Fury debuted during a time when fighting games were at their zenith in popularity. 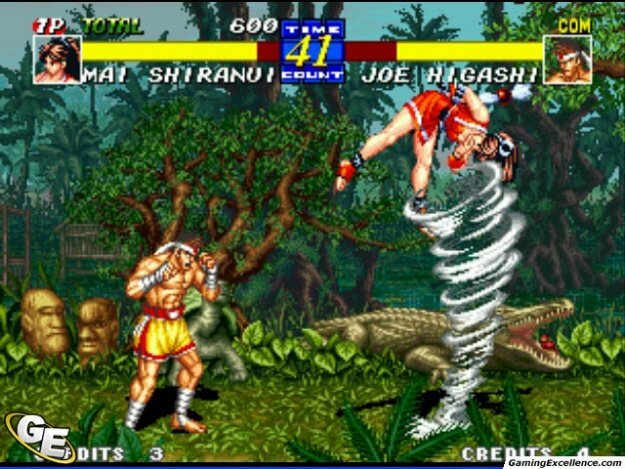 Led by the enormous success of Street Fighter 2, companies from all over tried their hands at creating a worthy successor. This however led to a glut of terrible games hitting the market. 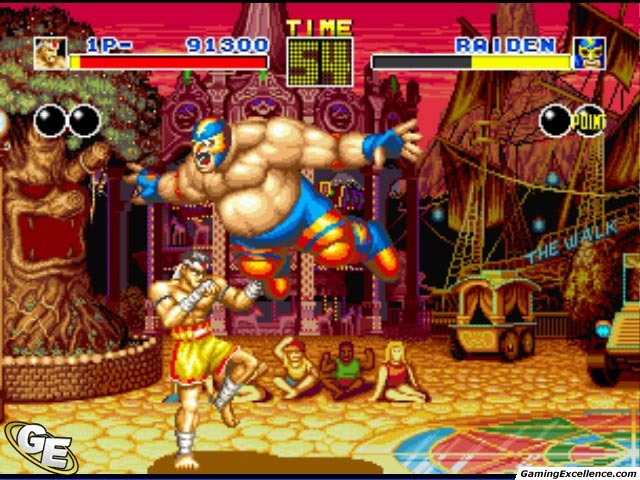 SNK had its own original fighter in Art of Fighting but also came out with something that played more like SF2, but was different enough to merit its own following and thus Fatal Fury was born. 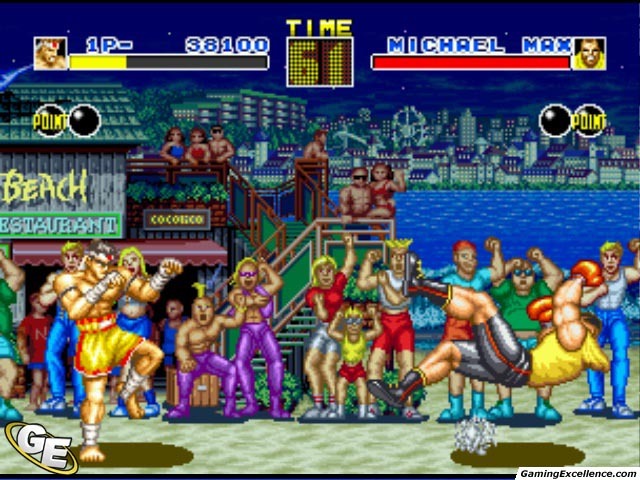 For gamers who enjoyed the home console versions of FF, FF2, and FF2S, you may be discouraged to know the titles in the FFBA are ports of the arcade/Neo Geo renditions. Therefore, unless you spent all your money at the arcade (or by tracking down a New Geo and the respective games) there will be an adjustment period. While the home versions were variably challenging these emulated editions are true to their originals. If you were lucky, enough to track down the PC version of FF3, then you've got an identical copy on the FFBA. 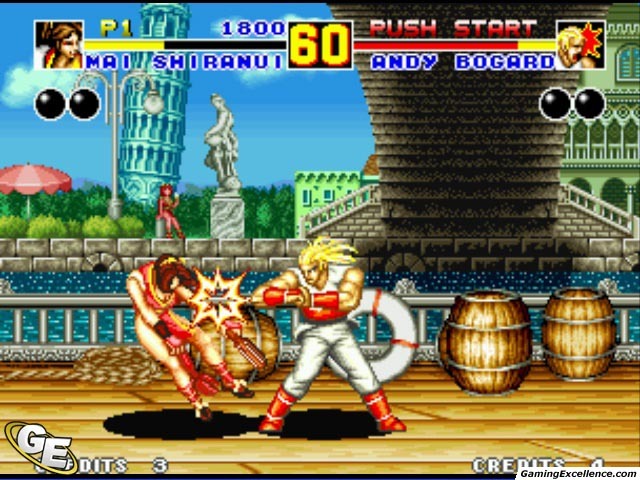 Terry and Andy are the Bogard brothers. After learning of their father's death at the hands of one Geese Howard, the brothers swear revenge by taking up the marital arts hoping that in time they could have a nice fist to face chat with Mr. Howard. The Bogard boys learn from their friend and fellow combatant Joe Higashi that Howard is hosting a tournament called the King of the Fighters. Therefore, it seems like a no-brainer for Terry and Andy to sign up. Outside of the easy difficulty setting, FF provides a challenging, borderline extremely difficult gaming experience. You may progress at a steady pace initially but things will pick up once you run into the game's final characters. The masked monster Raiden and the most well built looking adolescent Billy Kane will provide the occasional fits but they pale in comparison to Geese Howard. 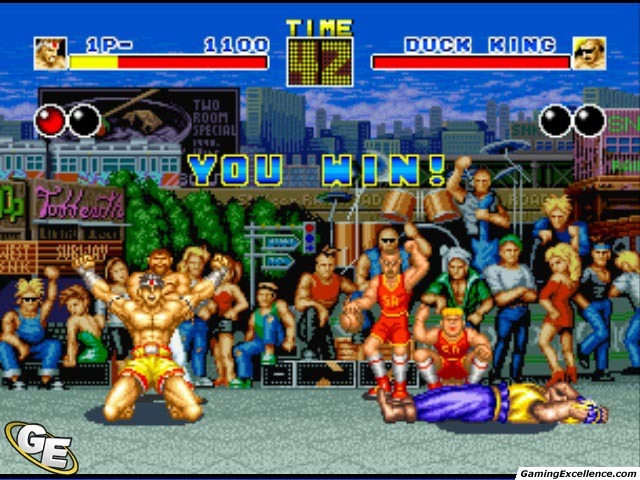 Not only does Geese have to audacity to fight you while wearing a wristwatch, he pulls out all the tricks possible (and impossible) and can crush you in seconds. He's evil, and he'll prove it to you every time you lose a battle to him. FF2 and FF2S are two separate games, but by comparison, they really are not that different. Both are an improvement over FF however in a number of areas. FF2 gives you eight playable characters (up from three in FF) and four bosses, while FF2S gives you fifteen by making the boss characters playable as well as bringing back a few pugilists from FF. There is a lot to like amongst the character selection. One in particular who is worthy of mention is Mai Shiranui. 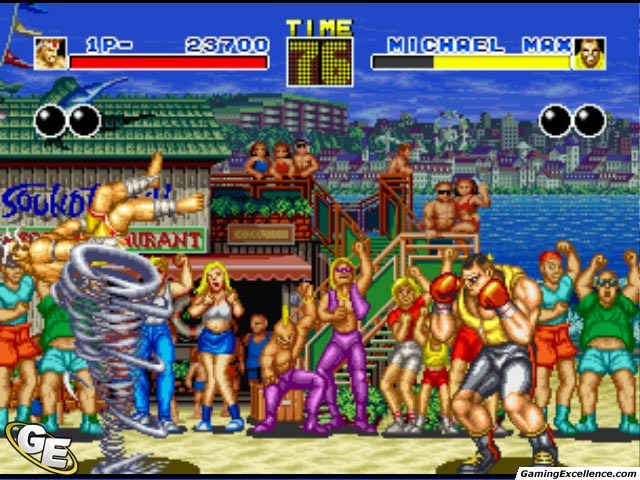 She brought "the bounce" to gaming long before any of those Dead or Alive women were conceived. The rest of the cast are no slouches either providing a considerate amount of balance amongst the roster of fighters. Another area of improvement from the first game is the audio. FF2 and FF2S have some of the catchiest tunes in any fighting franchise. Ranging from the patriotic sounding music in Terry's stage to the Symphony Harmonic tune that plays in the final boss battle and everything in between, there are some good jams accentuating the battles. Both games are also visually nicer than FF, and the control is noticeably looser than the original. Therefore, you can pull off regular moves and special attacks with greater frequency. The inclusion of critical special attacks when your health is low is a serviceable way in turning a fight back in your favour. It is just a shame that the improved controls couldn't be applied here because these moves are incredibly difficult to pull off. More often then not you greatly risk getting KOed just trying a CSA therefore their effectiveness is minimized. Fatal Fury 3 (or the fourth Fatal Fury game for those keeping tabs) is the best game in this collection. The engine isn't radically different from FF2 and FF2S but the controls have been tweaked enough so that even throwing a barrage of projectiles is now a reality. The critical special moves feel easier to execute now as well. The visuals received a minor upgrade making this game look the most vibrant and the great audio tracks from the previous two games have been replaced with new tunes that might not be as outstanding as before, but you won't feel inclined to mute your television either. The only negative aspect that comes to mind with FF3 deals with the noticeable drop in playable characters. You get the mainstays in Terry, Andy, Joe, Mai, and Geese and five newbies to the scene. Having new characters is fine, but not so much when the new guys don't measure up to the veterans. The great balance that existed in the previous FFs is lost here. Anyone who's become proficient with either of the Bogard brothers is likely going to be on the winning side of battles more than the gamer that plays as Hon-Fu. Once you've played through all the games in the FFBA, there really isn't much else to do. There is no online play and no new game modes. This collection is virtually a carbon copy of the AoF anthology in regards to presentation. Even the main menus when you select which game to play are the same with pictures of the FF characters in place of the AoF ones. Considering how much FF has aged gamers who were hoping to play Real Bout or Mark of the Wolves in this collection will be justifiably disappointed. The AoF Anthology had its fans and the same holds true for the FFBA. Anyone who is looking to play one of the more recognizable 2D fighting franchises could do a lot worse than this. For those who are universal fans of the SNK fighting franchises, here's hoping that the World Heroes and Samurai Showdown collections are not too far off, until then you're in good hands with the Bogards, Geese and the rest of the FF cast. Avi Krebs has been gaming for as long as he can remember, and has the honour to declare he's not only played through the one-hundred plus games in his collection, he's finished most of them to absolute completion. The primary platform in which our evaluation was conducted for the basis of this review is the PlayStation 2 version of the game.